Progress - 1 week post surgery, originally uploaded by pinkestblack. 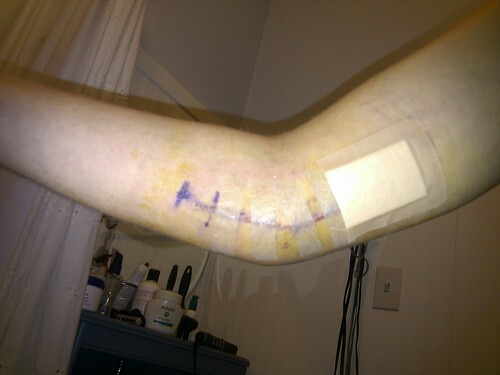 I removed my cast and bandages last night to change them, and snapped a quick photo of my incision. It's doing pretty well, as far as I can tell, though it is a bit raised this time (I hope that goes away). The purple line is just marker to show the incision line, the yellow is partially the sterilizing fluid from the surgery (I tried to clean off as much as I felt comfortable with) and partially bruising. It's bruised and swollen still, but looking ok. The big bandage at the top of the slice is covering a patch of skin that got ripped off with tape the day of the surgery. OW! I'm bruised and swollen near the interior part of my elbow, which I can only assume is why my nerve has been freshly located to, or where they borrowed fascia from to hold the nerve in place. It hurts more than it should.